St. Paul school district officials are trying to spice up their lunch menu to satisfy the tastes of an increasingly diverse student population. Over the past 18 months, the district has rolled out new meals using Hmong, Mexican, Somali and Thai recipes. But officials say it's tricky finding authentic ethnic foods that all students will eat, that meet strict nutrition guidelines and are inexpensive to prepare. St. Paul, Minn. — The cafeteria workers at Highwood Hills Elementary School in St. Paul serve about 400 meals each day. This month's menu features such regulars as hamburgers, pizza, sloppy joes and taco salad. But an informal survey of fifth and sixth grade students singled out a clear favorite -- chicken nuggets. Highwood Hills students recently expanded their food horizons beyond their beloved chicken nuggets, when the school served as the district's test kitchen for a new ethnic meal. Students sampled a Somali dish known as chicken suqaar. In the predictable world of the school cafeteria, sixth grader Genesis Andrade needed time to adjust. "It was all right," Andrade said. "When you first look at it, it looked kind of gross. But then, when it was in your mouth, it was good." A fifth grade student, Caprice Hutchenson, had a less-than-enthusiastic review. "It was all right," Hutchenson said. "It wasn't that good, but I still ate it not to be rude." 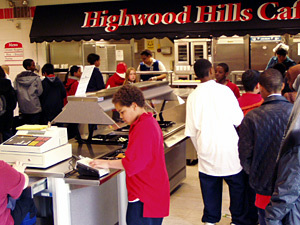 There are about 60 Somali students at Highwood Hills. And when it comes to food, some of them are tough critics too. For sixth grader Ifrah Ahmad, the recipe had lost something in translation. "I don't know, I can't actually tell what it was, but it doesn't taste the same as the ones I eat at home," Ahmad said. "It didn't taste exactly the same." Still, school district officials gauged the experiment a success. They now plan to serve the Somali meal to more than 30,000 students in September. Nutrition services officials dropped Thai sweet and sour chicken because the dish was difficult to prepare and students gave it a thumbs down. Adding a new ethnic meal can take a full year of work. The district gets its ethnic food ideas by reaching out to parents and local community members. It worked with two Somali women to turn one of their traditional family recipes into a mass-produced school meal. Beef and lamb dishes were ruled out as too expensive. Chicken suqaar made sense because it includes some of the district's vast supply of government-surplus ingredients. Large school districts nationwide have made similar menu adjustments to better reflect their students. Erik Peterson of the School Nutrition Association said St. Paul is on the cutting edge of a trend that makes financial sense for schools. "I think the reason why school districts and school nutrition programs and school nutrition professionals are reaching out to these communities for the recipes, and to see what they prefer, is really part of the nature of what the school food service business has become these days. That really is a business trying to reach out to customers," Peterson said. But school officials say the addition of ethnic foods also provides a way to honor the cultures of their students. That lesson is not lost on Fouzia Said, one of the parents who helped develop the Somali recipe. She says St. Paul schools are making Somali students feel welcome by serving some familiar food. "I am sure that it is very exciting for the Somali kids to come to school," Said said. "And it might take maybe once a month or maybe even once in a while to have a Somali dish served hot at school." About 1,000 Somali students are enrolled in St. Paul schools.